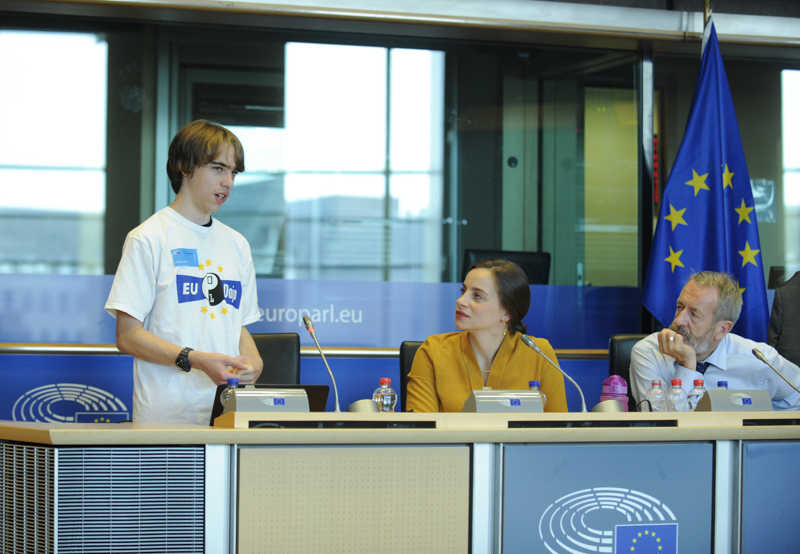 On Wednesday 17 October, CoderDojo held our sixth annual EUDojo in the European Parliament in Brussels. Since last year’s event, CoderDojo has grown significantly, with almost 500 new Dojos. It is incredible that this Irish-founded initiative has turned into a global phenomenon, with clubs in over 100 countries worldwide. 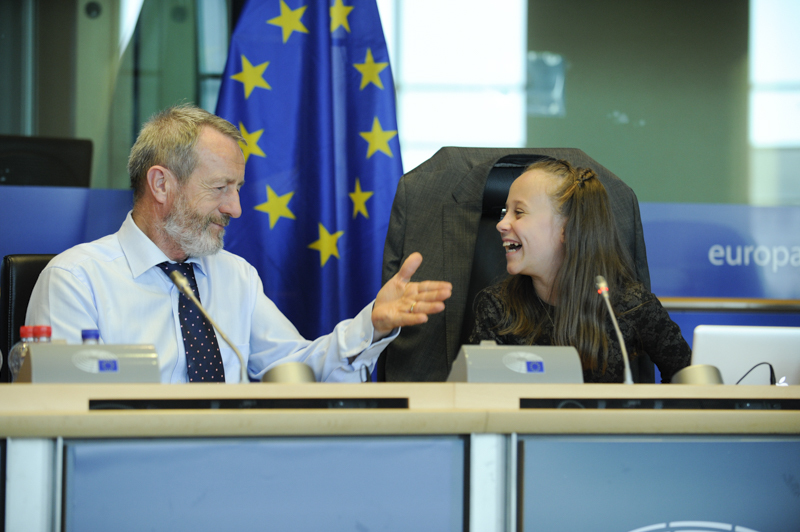 EUDojo coincides with the sixth year of Europe Code Week, and the event was co-hosted by MEP Sean Kelly and the EPP party. It was attended by MEPs from over 10 countries. Volunteers, champions and parents from across nine European countries were invited to participate, along with over 40 young coders who travelled to the EU Parliament from Italy, the United Kingdom, Bulgaria, the Czech Republic, Moldova, Romania, Belgium, Spain, Portugal and Ireland to showcase their coding and technology skills. Here, the children taught MEPs how to write their first lines of code, and showed MEPs and sponsors projects they had already created. 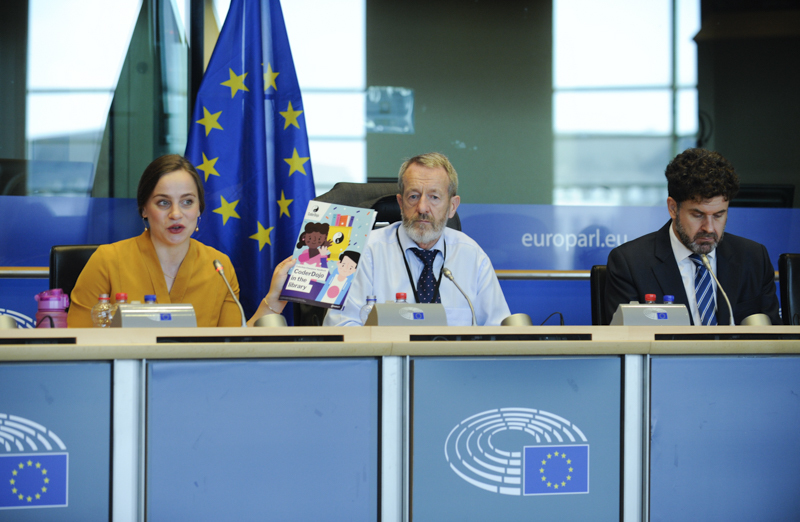 Giustina Mizzoni, Executive Director of the CoderDojo Foundation sharing our newly released handbook for libraries to support them in running a CoderDojo club. Irish MEP Sean Kelly opened the event and spoke of the pride he felt working with CoderDojo on such a special event. EUDojo took place during Europe Code Week, which runs from 6–21 October this year. During the coding session, the young coders taught MEPs how to create a basic game using Scratch, a visual coding language developed by MIT,- and showed them how to build a website using HTML and CSS. Participants also learned how to code using a micro:bit, which created a fantastic buzz amongst the young people and MEPs. The CoderDojo youths were also given the opportunity to showcase projects that they have made in their local Dojos. This year Nadezhda from the Sofia Dojo in Bulgaria showed her project on her scratch game for developing agility skills. It is a custom representation of the cat – mouse – cheese chain mouse can stay safe in its home but cannot resist the delicious taco outside. But along with the taco a cat is lurking on its mat waiting for the mouse to show up. With every taco brought in, the mouse is getting faster and also the cat efforts to get it. The game is over once the cat catches the mouse. The challenge was to help the mouse get as many tacos as possible. Lucy and Caragh from the Waterford Dojo in Ireland presented two very different projects. Lucy presented her project called ‘Piano Pal’. The project is about teaching the basics of learning and practicing to play the piano. Caragh Bolger presented her projected on ‘How to make the world a better place’ which is about the little things that make the world better. Edward from the Harrogate Dojo, UK presented his project on a program he coded to encrypt and decrypt files in C++ . 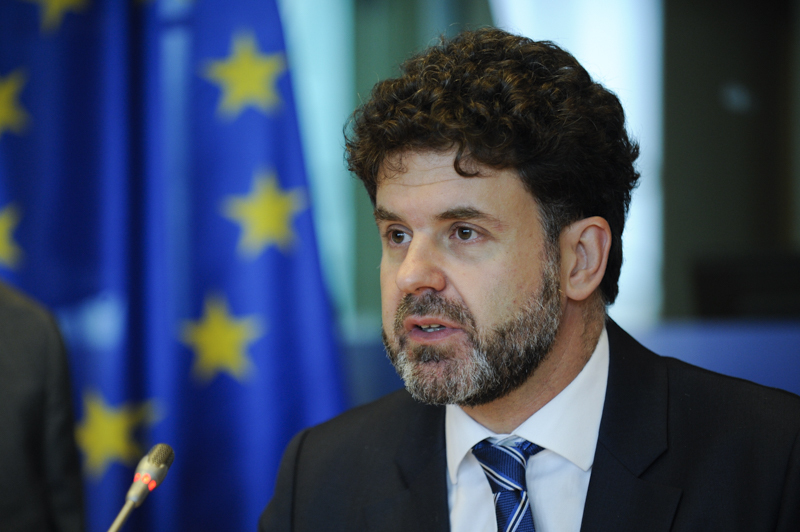 Cabinet member Manuel Mateo Goyet discussed the importance of digital skills, highlighting the importance of encouraging girls to get involved. He noted how he was delighted to see just as many girls coding at EUDojo as boys, and how he was looking forward to sharing photos from the day with his daughter to encourage her too. 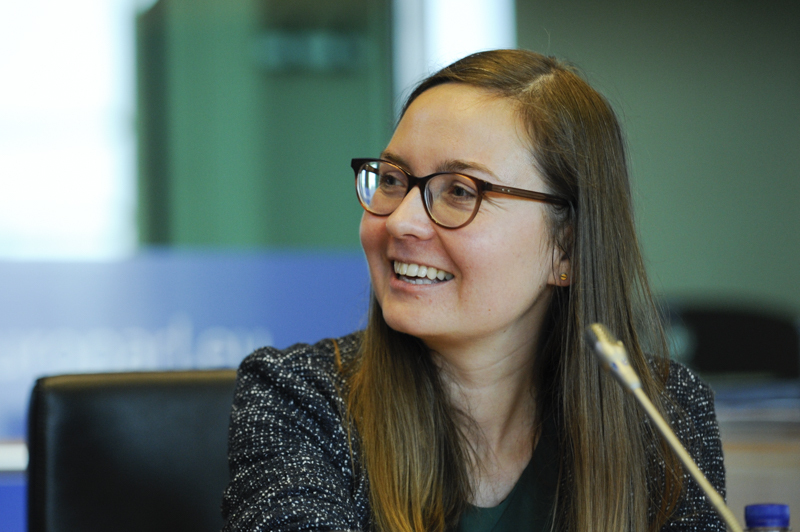 Karolina Telejko, SAP’s EU Government Relations Director, discussed their approach to training, lifelong learning, building partnerships, and explained why they decided to spread coding skills around the world. 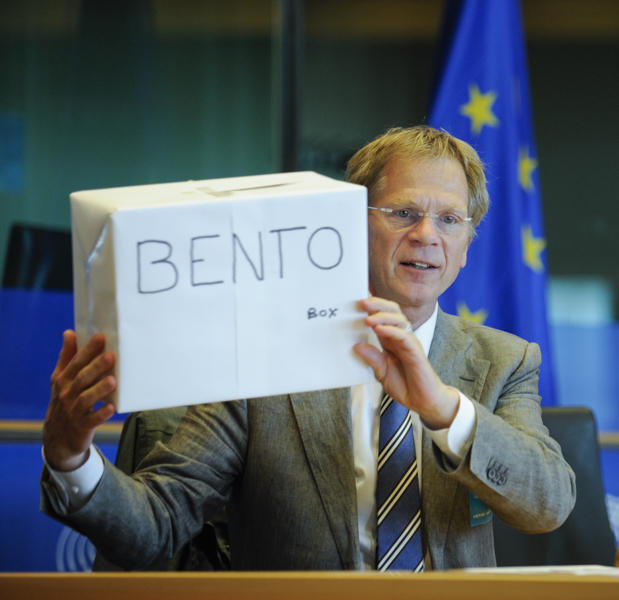 Derk Oldenburg of Liberty Global spoke about the Future Makers Bento Box and Social Innovation. Derk challenged the young people to find a social problem and design a solution using technology. See more photos from the day on our Flickr channel.